features spacious tables and congenial light, surrounded by publications relevant to political scientists of every stripe. The library’s renovation was funded by the Classroom Renovations Committee and the Barnette Miller Foundation, which was established in 1956 with a bequest by Professor of History Emeritus Barnette Miller to provide for the advancement of the study of and research in international relations by undergraduate and graduate students; to grant scholarships, to acquire books, manuscripts and other aids; and to provide for lectures. Jane Bishop '51 Associate Professor of Political Science Stacie Goddard spearheaded the idea to dedicate PNE 251 to Stettner, and Rania Bartick served as the design consultant. The community was invited to the public unveiling of the space on Tuesday evening, and many attendees came and shared fond recollections of Professor Stettner with one another. 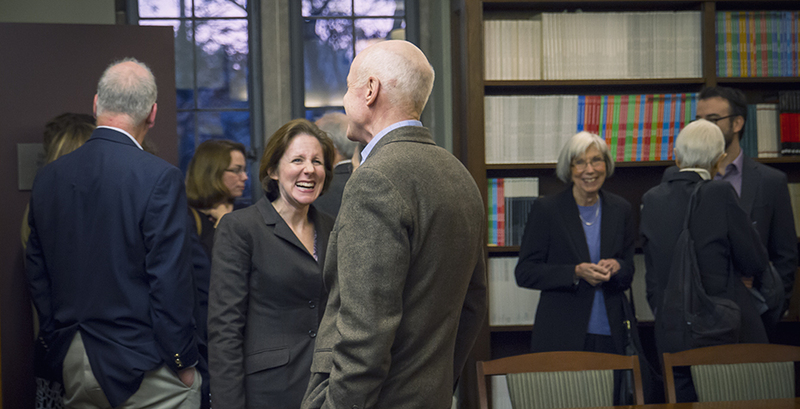 How appropriate that the Political Science Library/Seminar Room at Wellesley will be named for Ed! His exceptional combination of scholarly excellence, administrative skill, personal warmth, and graciousness stands out for all of us who were lucky enough to know him and work with him over the years. He did a lot for Wellesley, and we are all fortunate that he chose to spend so much of his life at the College. Ed was a one-person learning and teaching center, a mentor to me and countless other junior faculty who were like deer in the headlights, a ready-made professional development seminar (long before we would think of our work as faculty in terms of professional development). I cannot have imagined what my life as a faculty member at Wellesley College would have been without Ed’s guidance, wisdom and support…. Other formal tributes came from Wellesley President H. Kim Bottomly; Provost and Dean of the College Andy Shennan; William R. Kenan Jr. Professor of Political Science Marion Just; and Virginia Onderdonk Professor of Philosophy Emerita Maud Chaplin. On behalf of the Stettner family, Victoria Stettner Sundren ’89 spoke to the assemblage about her father. Joseph also referenced a warm remembrance of Ed Stettner published by Wellesley magazine and written by Roxanne Euben, who is the Alice Freeman Palmer Professor of Political Science, an endowed chair that was first held by Stettner. A framed copy of the article is displayed in the library. Ed earned a B.A. from Brown University in 1962 and a Ph.D. from Princeton University in 1968. He joined the Department of Political Science in 1966 and initiated generations of Wellesley students into the rigors and rewards of political theory, for which he was awarded the Pinanski Teaching Prize in 1997. He assumed the duties of chair of the department no fewer than three times and served in the dean’s office on several different occasions, including as dean of the faculty from 1984 to 1988, and associate dean of the College from 1977 to 1986. Ed’s kindness and courtesy toward all, from the most junior to the most senior among us, was legendary. … [H]is inexhaustible knowledge of the rules and folkways of the College… was unparalleled. Ed was also a model of collegial citizenship, giving generously of his time, energy, and abilities whenever the need arose, from stepping in to teach a writing course to directing the now legendary Washington Internship Program for more than a decade, to helping devise the early-retirement plan for faculty. Gentlemanly and judicious, he preferred understated persuasion to impassioned argument. He invariably counseled restraint, calm, and a sense of proportion over quick action and reaction. His natural impulse was to “do it right,” rather than maneuver for personal gain. His word was eminently reliable, his advice temperate, his constancy a bedrock of the department. Students cherished his patience and clarity, often describing him as a force of stability both in the classroom and out. Ed gravitated to progressive democratic and liberal political thought in his scholarship—his book, Shaping Modern Liberalism: Herbert Croly and Progressive Thought (1993), is a case in point—and he taught Wellesley students to treasure the American tradition of democratic theory. He was an exemplar of this same tradition in his personal conduct. He never used his reputation and influence to advance a personal agenda, was always attuned to the traps of hierarchy and exclusion, dedicated to deliberation as a moral good in itself, and hopeful about the wisdom possible when individuals come together to reflect upon purposes larger than their own.